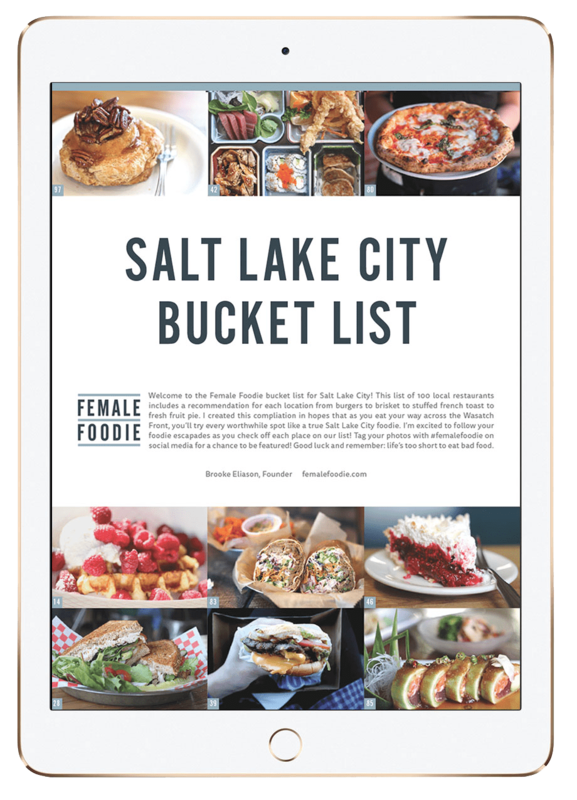 Created by affiliates of popular Bay Area dim sum restaurant Koi Palace, Dragon Beaux in San Francisco’s Outer Richmond is a restaurant that serves traditional dim sum with a modern twist. Like many dim sum restaurants in the Bay Area, you’ll find people waiting outside Dragon Beaux for a table on the weekend. 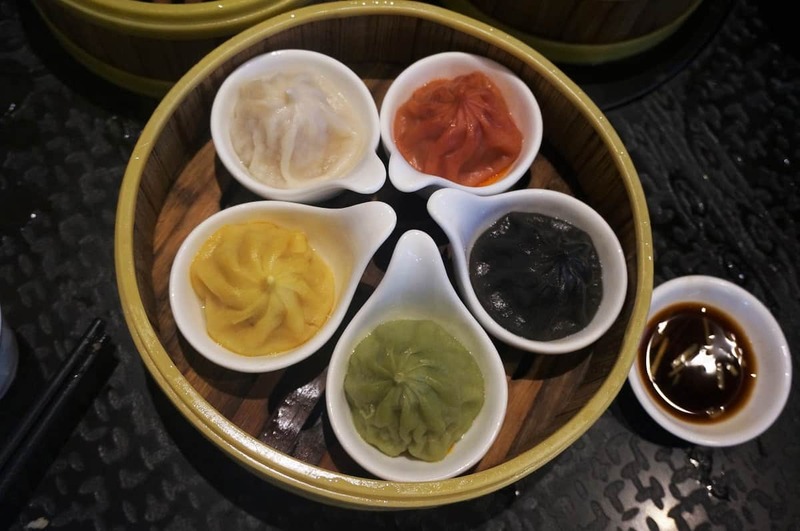 They have limited reservations for groups of 7 or more during their peak dim sum hours which are 11:30 a.m.-1:30 p.m. Monday-Friday and 10:30 a.m.-2 p.m. Saturday-Sunday. Reservations mean that your group is placed first on the list when the whole party arrives, and seated when a table is available, which may still be a short wait. For everyone else, you get a number and then wait for your number to be called which is also displayed on the TV screen. Having lived in Hong Kong, gathering a large group together for dim sum/Chinese tea is one of my favorite weekend lunch activities. I also like that Dragon Beaux offers creative dim sum dishes that are not found at other dim sum spots in the Bay Area. Once you get a table, you choose the tea you’d like (note that there’s a per person tea charge at most dim sum restaurants). 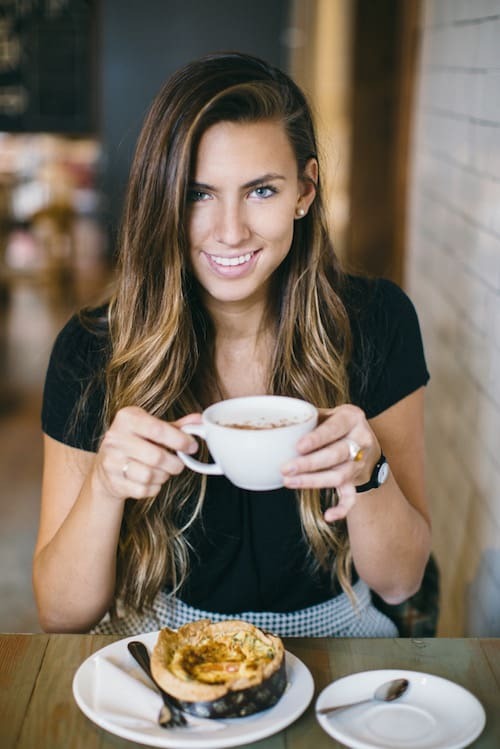 The server serves a pot of tea and a pot of hot water. When you run out of tea, leave the lid open and the server will refill your tea pot. You get a menu in which you can mark up the items you want to order. For dim sum, items are priced based on size/complexity (XS, S, L, M, XL, Q), which is listed in the footer of the menu. Prices here are higher than your average dim sum restaurant. Dim sum is best with a larger group so you can try more dishes and split the costs. If you prefer to see the dish first and do not want to order from the menu, they have servers that bring over a tray of dishes to each table that you can point to and order from as well. Each time a dish or basket arrives at your table, the server will stamp your card which is used at the end of the meal to calculate the bill. We ordered the Sea Bass Dumplings and the Baked BBQ Pork Baos (buns) from the servers walking around with the trays. The Sea Bass dumpling is a steamed meat dumpling topped with sea bass which was delicious. The pork buns were also good, especially their sweet, crispy crust similar to a pineapple bun. You can ask the server to use scissors to cut up the buns for your group to share. Another item to try is the Five Guys Xiao Long Bao. Xiao Long Bao (XLB) is a soup-filled pork dumpling. Be sure to dab some vinegar and ginger on the dumpling and drink the soup, but be careful that the soup is hot. The white one is the traditional pork XLB with natural flour skin. The other ones clockwise from the natural flour skin are beet skin with fresh beets, squid ink skin with black truffle, spinach skin with kale, and turmeric skin with crab roe. 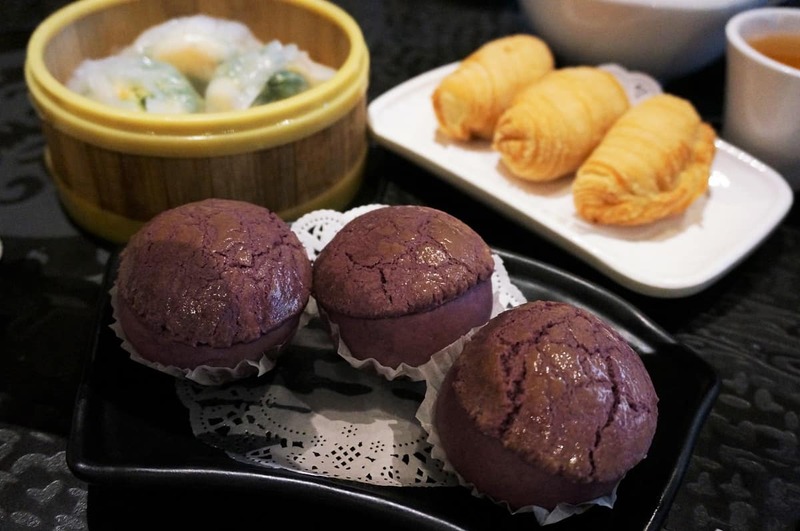 Other sweet items that I enjoyed were the Baked Purple Yam Bao with a sweet, crispy top and stuffed with mashed purple yam. We also ordered the durian puff dessert which is an acquired taste for those who like durian. We made the mistake of including the puffs in our original order rather than waiting to order it at the end, so they arrived with our other dishes and got cold by the time we ate them. 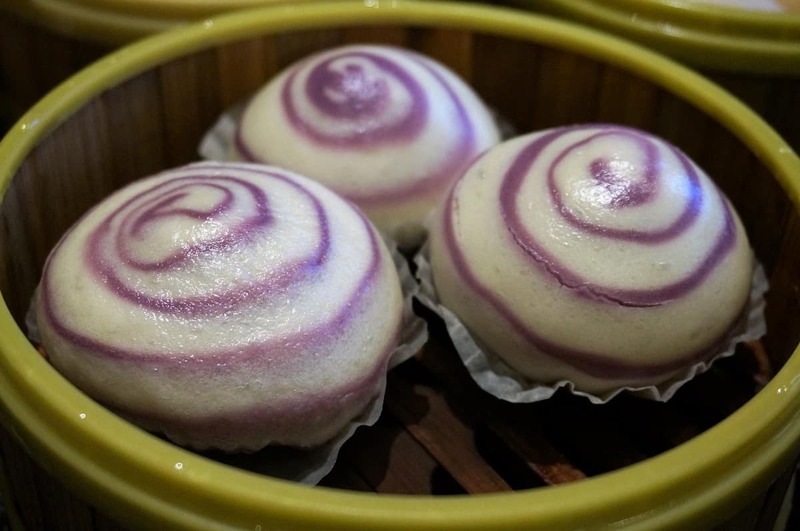 The Baked Taro Paste Bao was also delicious with oozing, creamy taro paste. A novelty item that I haven’t seen elsewhere is the abalone tart. 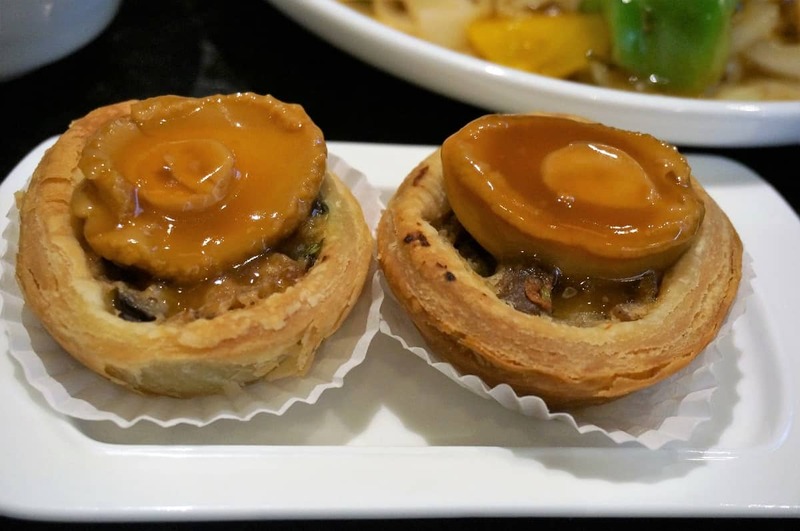 Whole abalone is placed on top of a baked mushroom tart for a combination of sweet and savory. Our group had mixed reviews over this dish. Overall, if you’re looking for traditional dim sum, the original Koi Palace in Daly City may be a better bet for you. 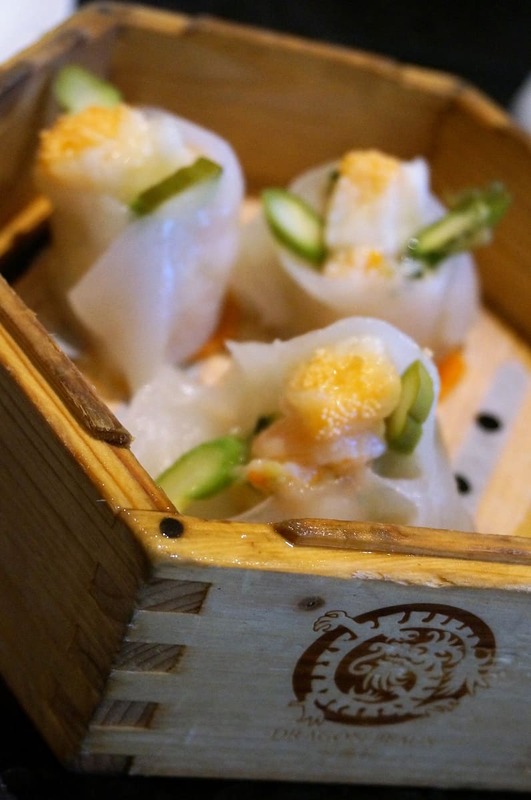 Dragon Beaux is a good option for those looking for non-traditional dim sum items. Dim sum is only served at lunch here. They offer hot pot during dinnertime which I have not yet tried.